Crystal Lake Camp Counselor Party! We had a great time celebrating Friday the 13th at Sparrow Tavern in Astoria! We ate camp-inspired food and sipped camp-themed cocktails while the Friday the 13th Films were projected onto a creepy torn screen. It was a fabulously fun and creepy evening. I’ve been told that they hope to make this an annual event and I really hope that they do. 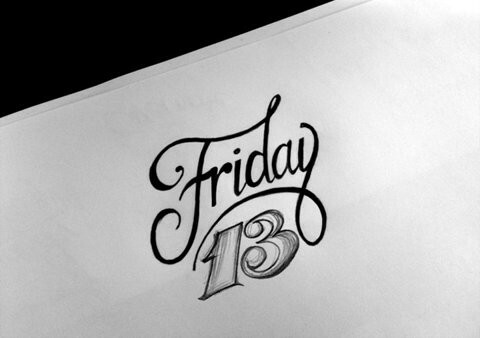 There are two Friday the 13ths in 2013! We’re looking forward to September and December of 2013! The Raven & Black Cat wishes you a wonderful Friday the 13th! Sleep Away Camp Slasher Film Tribute Night! There are TWO Friday the 13th Events happening in Astoria. Is nothing happening in Manhattan?! If you know of any other events, please let us know! Come in your best Campy Slasher Flick Inspired Outfit. Friday the 13th & Sleepaway Camp will be projecting starting at 10pm while Nick Da Smoother DJs this epic camp dance. Camp inspired drinks all night!! Start the night off with a special screening of the original Friday the 13th movie at 7:00 PM and then take in a horror themed burlesque performance by the ladies of D20 Burlesque at 10:00 PM. Patrick Walsh of horror podcast ‘Scream Queenz’ will MC. Any remaining tickets are $15 at the door. “S” and I celebrated Friday the 13th with a moviethon, some friends, and delicious treats. Here are some photos and tips on how you can celebrate with your own event when the spookiest of Fridays returns in April. We sipped delicious Blood Orange Sangria while we watched the first four Friday the 13th movies. Click here for the recipe. We enjoyed nibbling on a fruit plate and a veggie platter, but it was the desserts that stole the show. I made a raspberry gelatin brain topped with raspberry simple syrup. Click here for the recipe. A similar brain mold can be purchased here. Our dessert table also featured Gingerdead cookies, Crumbs Cupcakes, Chocolate Peanut Butter Buckeyes. Click here for the Buckeyes recipe. A Gingerdead Cookie Cutter can be purchased here. I pulled out some of my halloween favorites for the party decor. The Sangria was served in my Pottery Barn Mason Jar Drink Dispenser and Mason Jar Mugs. Every August Pottery Barn features a fabulous Halloween collection. I used the salad plates I bought as dessert plates. Keep an eye out for their 2012 Halloween Collection and check out this Halloween Wall Decal on Sale right now for a steal! I covered the Little Penguin Merlot bottles that we used for the Sangria with Marthat Stewart Skeleton Beverage Labels. You can purchase a set for your own party here. I found this wooden candle holder on ebay, which is a great resource for unusual Halloween decor. The Raven is from Grandin Road‘s seasonal Halloween Haven. Look for them when it reopens in August or purchase a similar one here. This Friday the 13th Bowl features Jason on the other side and is great for serving chips or popcorn. It can be purchased here. We watched the Friday the 13th Deluxe Edition Four-Pack which contains the first four films. Click here to get yours for under $16. We played a game of Friday the 13th Movie Bingo during the first 3 movies. I made the custom bingo cards here. Everyone marked their cards as they saw each item on the list appear in the movies. Prizes were awarded to the first to get Bingo,four corners, and fill their card. I used candy, gift cards, and this fantastically creepy Blood Energy Potion. I used the following list to make the radomized cards. Add to it or create your own. Friday the 13th is a fabulous excuse to celebrate Halloween any time of the year. This evening I will be hosting a few friends for Horror Movies, Spooky Games, and Terrifying Treats. I can’t wait to watch the Friday the 13th films while sipping a glass of Blood Orange Sangria.